Our Costa Rica mountain bike tour in Tamarindo is the ideal choice if you are looking to add a bit of adventure and challenge to your vacation routine! We provide top quality front suspension mountain bikes so you will have a fun and safe time on our farm which backs up into the mountains, offering you a great variety of terrain on which to play. Splash through a creek, admire the foliage, look for monkeys, listen to the birds… the trails on our farm will provide a feast for the senses as well as the physical challenge you are craving! If you are looking for a bit of a challenge or something off the beaten path in Costa Rica, the Pura Aventura is the best mountain biking tour in Tamarindo. Even better, The Real Deal Tours offers the best tour deals in Costa Rica, so book your discounted mountain biking tour with us and save cash too!! One of the must do activities, if you are staying in any of the beach resorts near Tamarindo, is a visit to Hacienda Norma, a 150 year old working horse and cattle ranch on over 1400 acres of forest that could be considered the mecca of ecotourism in Guanacaste. We invite you to join us and experience Costa Rica ecotourism at its best. 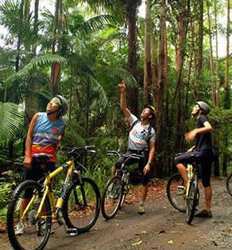 Pura Aventura Mountain Biking Tour deposit is $10.00 per person for 1 Activity, $20.00 per person for 2 Activities and $30.00 per person for 3 Activities.